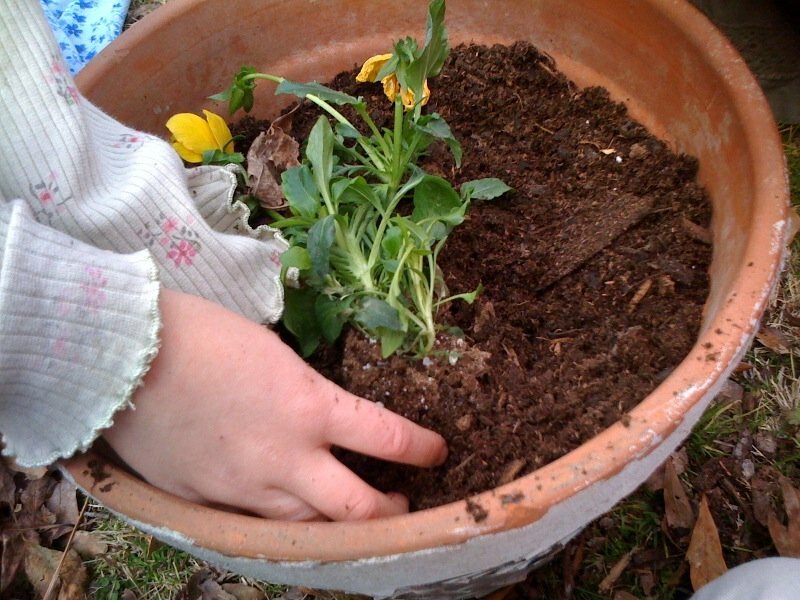 Getting into the Gardening Mood! Yep, it’s that time again! 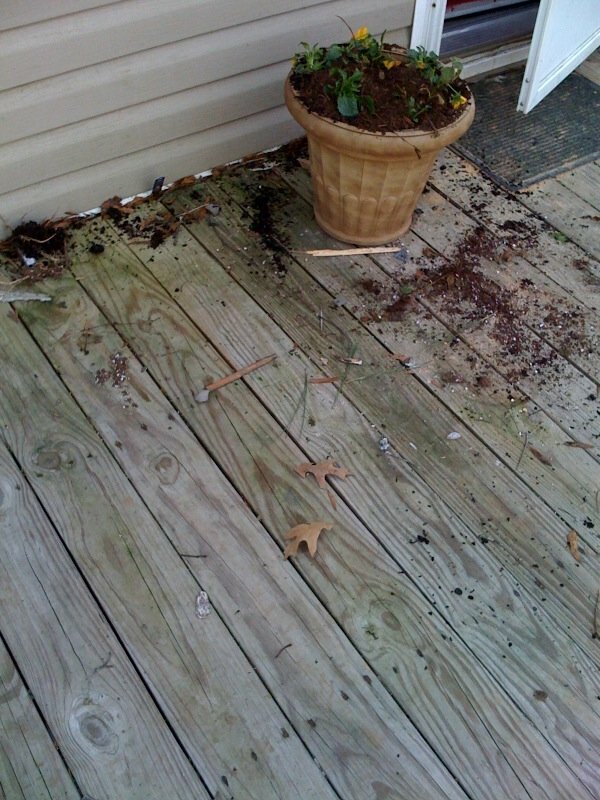 It all started when I walked outside to get the mail the other day and stood looking around the front deck in disgust. The build-up of fallen leaves, tracked mud, mis-matched shoes, and other bits and pieces just finally pushed me over the edge. 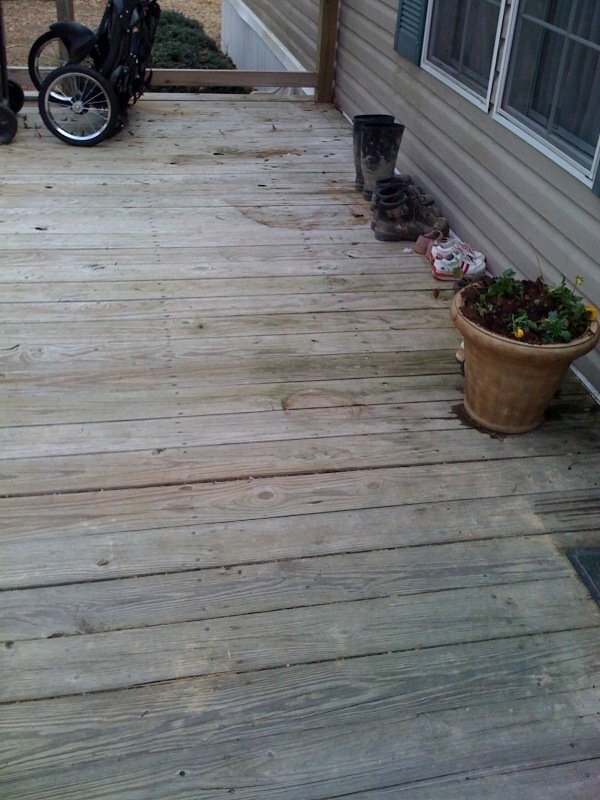 Time to Spring Clean the deck! 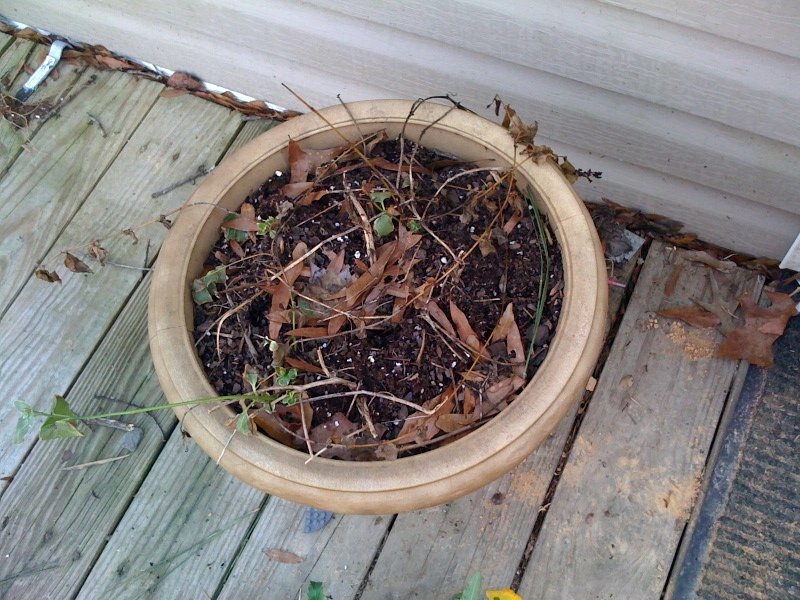 My two large planters looked so sad with their dead annuals and crusty dirt. 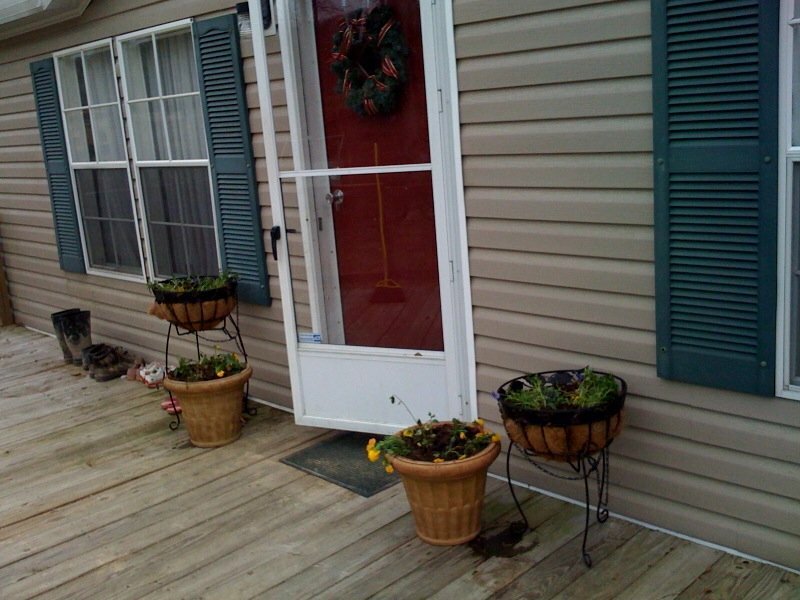 So I decided to get pansies and liven up all the pots on the deck, then clean up the mess when all the planting was finished. 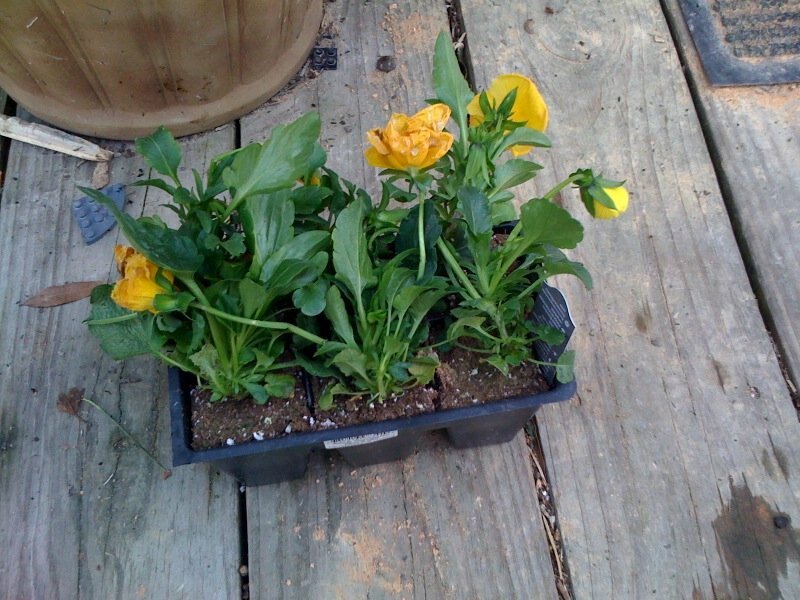 I nabbed two flats of pansies while doing the bi-monthly grocery shopping, then promptly came down with a raging sore throat, fever, and chills, and the poor plants sat on the front deck for a week with no one to think of them (or water them!). 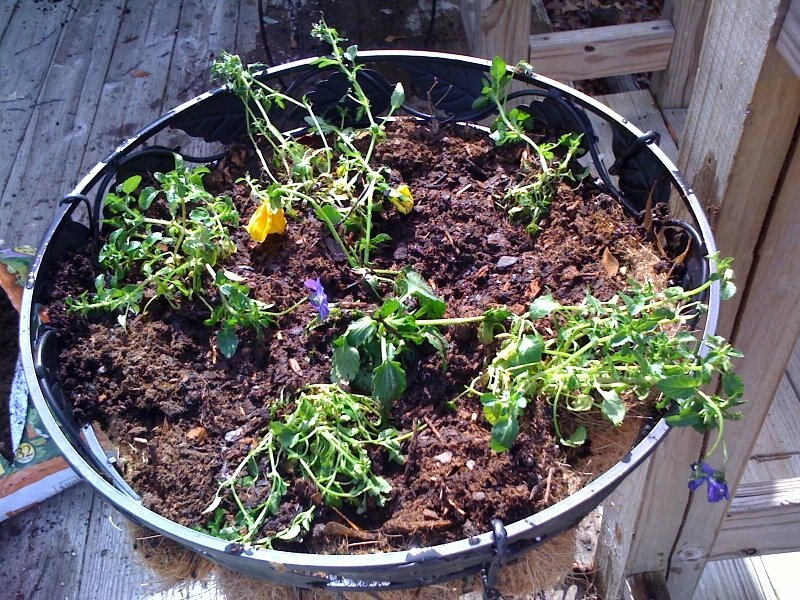 By the time I was up and around again, the pansies looked like a lost cause. But I decided to plan them and just see what happened. 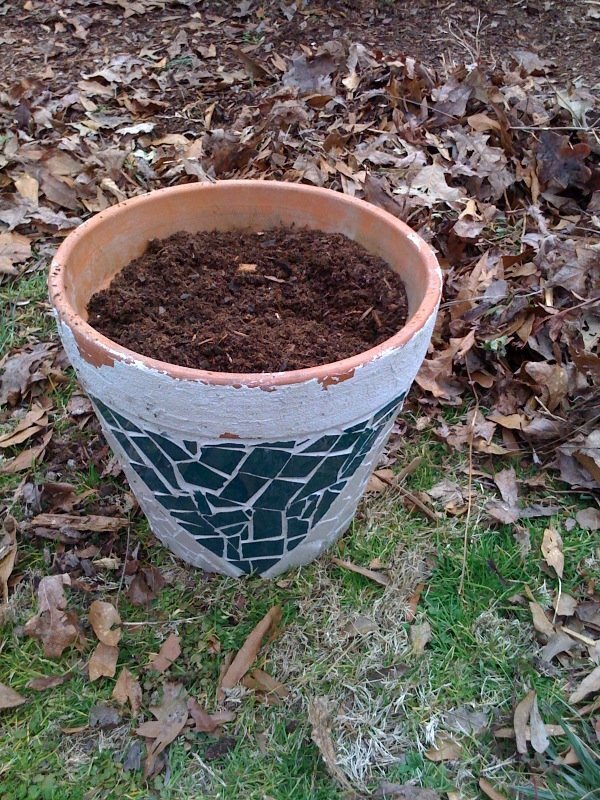 I grabbed my potting soil and tackled the dirt in the two large iron planters. 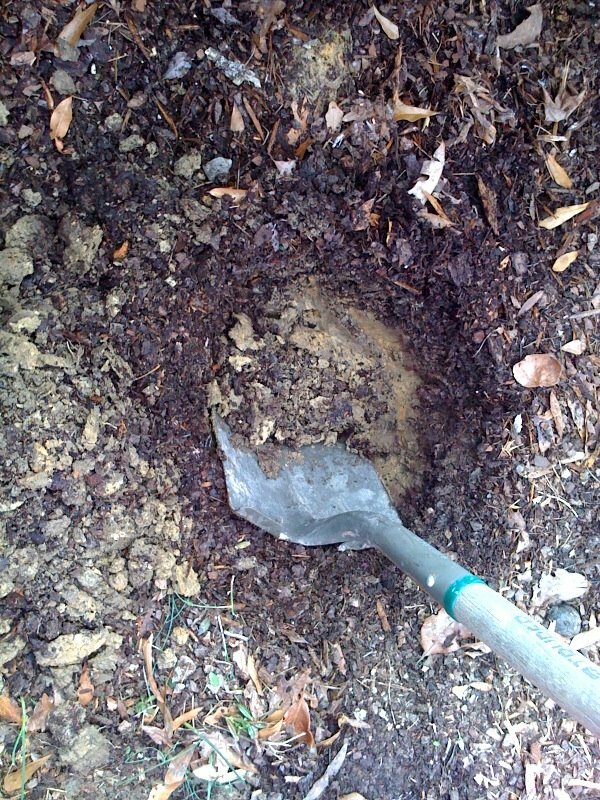 The soil was so compacted and tough that it took a while to get the crusty layer out and mix up a nice layer for the plants. 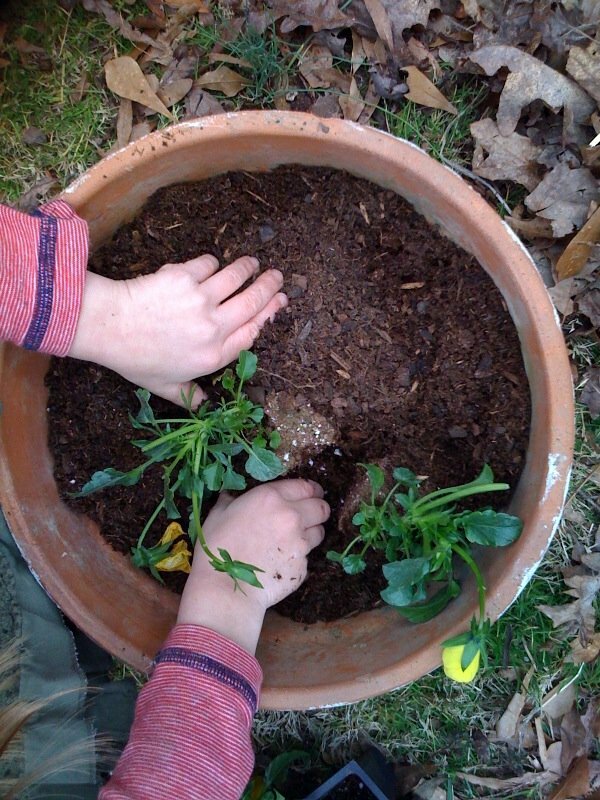 But the pansies looked a little happier to be in nice, loose soil and have some water. 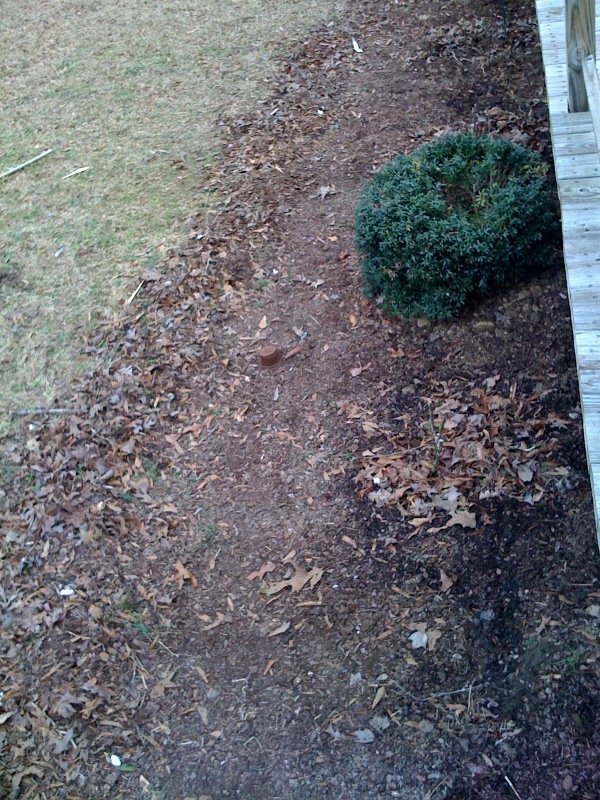 You can see the mess of dirt and leaves waiting to be swept. 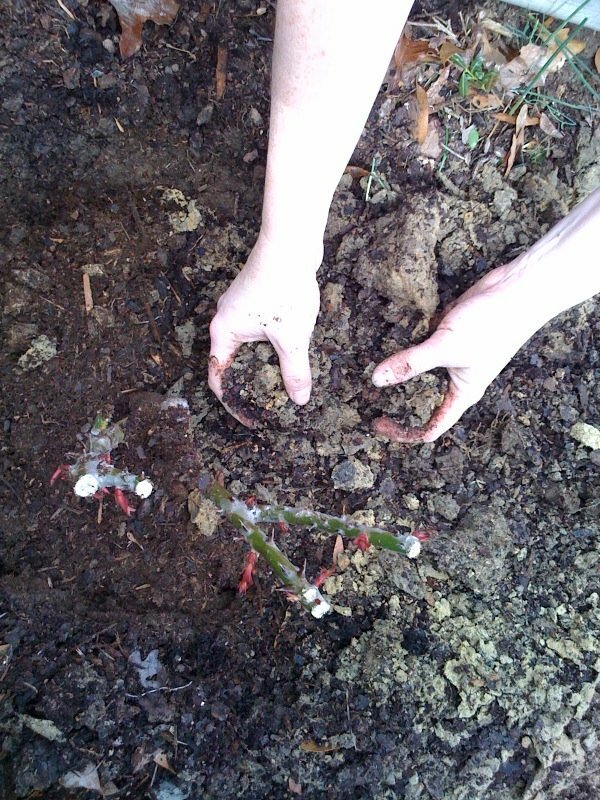 But I wanted to finish planting first, and I’d fallen for some roses while shopping, too! 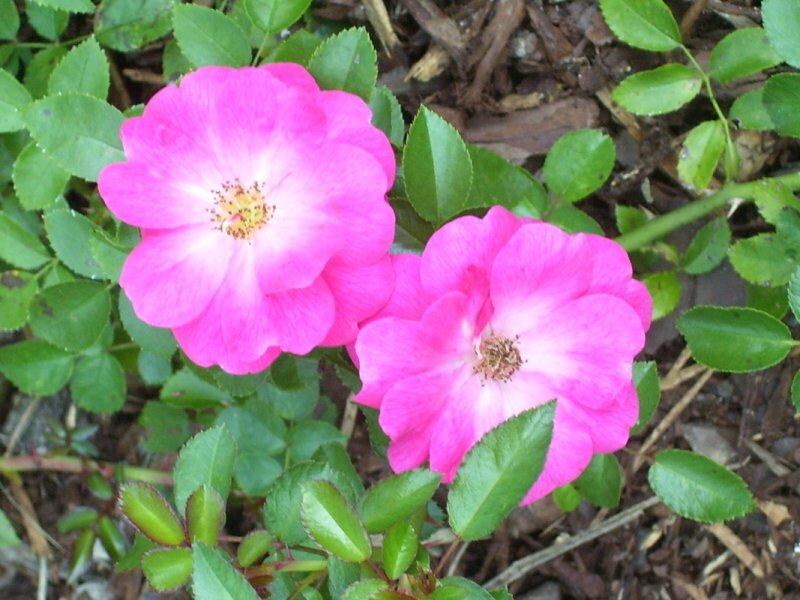 I picked up two Chicago Peace bush roses and two coral-colored climbing roses for $4 each. Naturally, the package said, “place in ground immediately,” but mine sat out with the rest of the flowers while I was sick. They didn’t look the worse for wear when I finally got to them. Roses are tough. 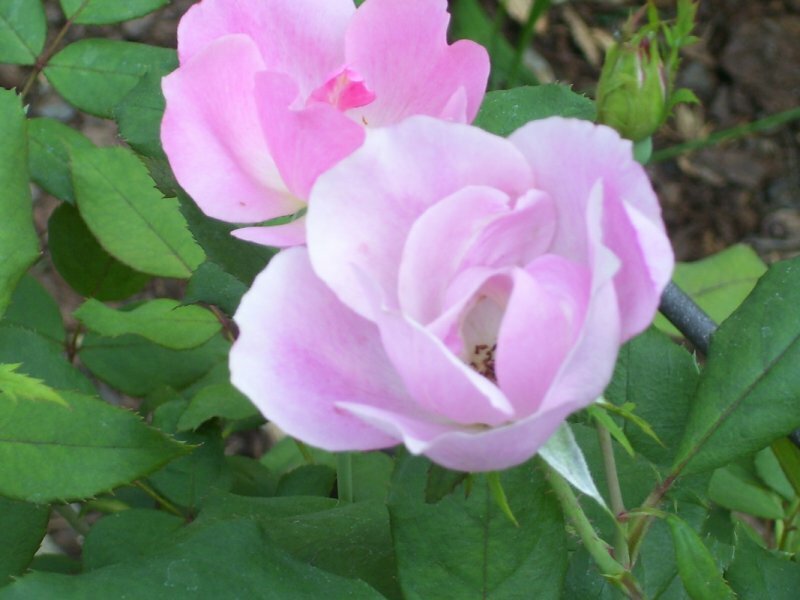 I used to be afraid of roses. I thought only master gardeners could care for these wonderful plants. I quickly found out this is a myth! 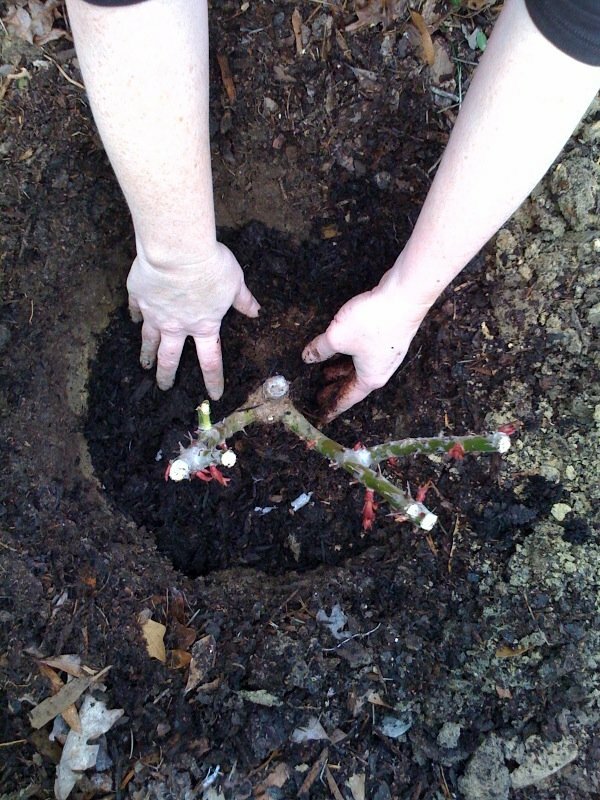 Roses are easier to care for than almost anything you can plant. 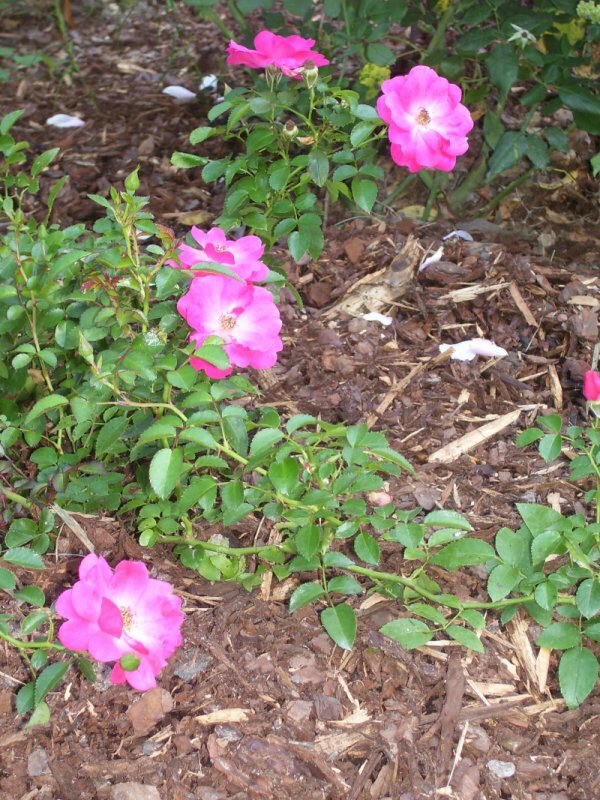 You only have to be vigilant through Japanese beetle season and watch for black spots on the leaves that can indicate mold — watering early in the day prevents this, as the sun has a chance to evaporate the water and dry the leaves. 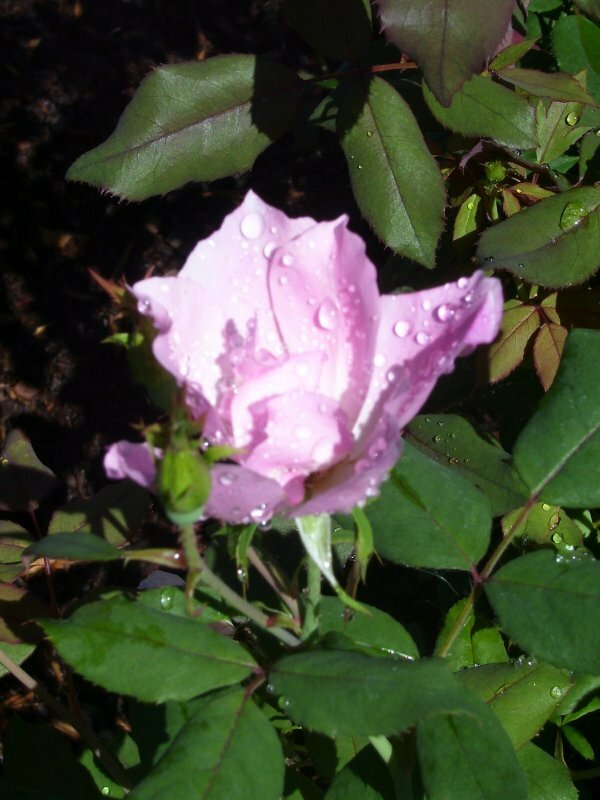 What’s most wonderful is that roses positively thrive in a hot, sunny environment like the one in which I happen to live. Serendipity! 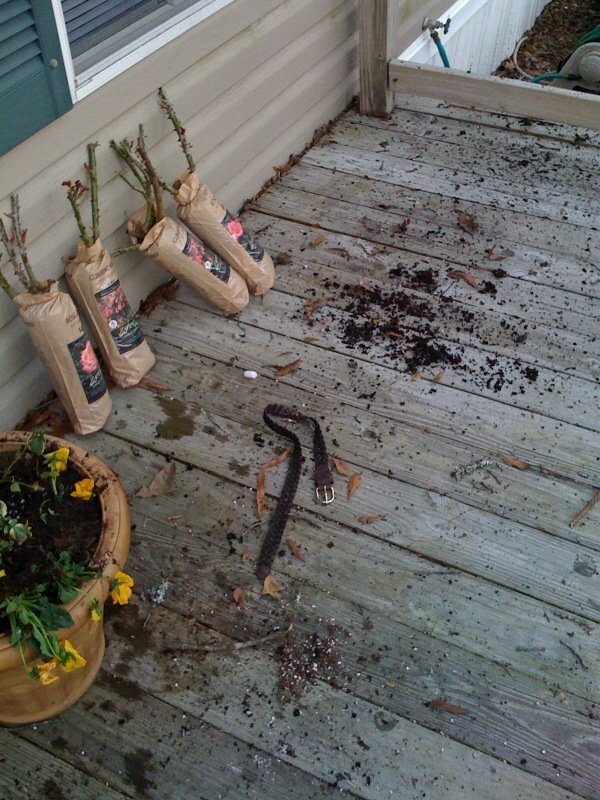 So I happily picked up new roses to put in front of the deck. The finished results gave us all a smile. 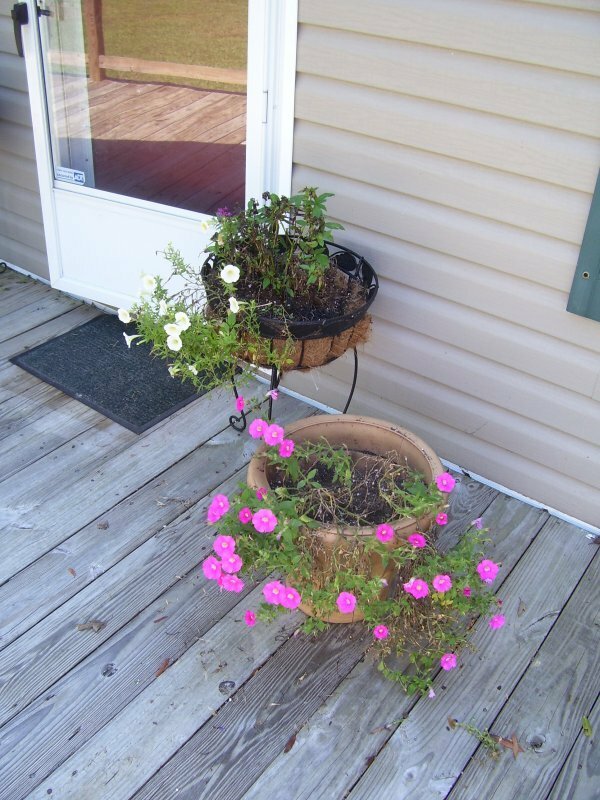 How nice to have flowers nodding from their planters and a clean, swept floor to greet the eye! With more days of sunshine and water, the panies perked right up and looked fresh, too. The welcome mat is out, so come on in! Time to show off the flowers! I adore a cottage garden, and this is just the perfect place to have one! 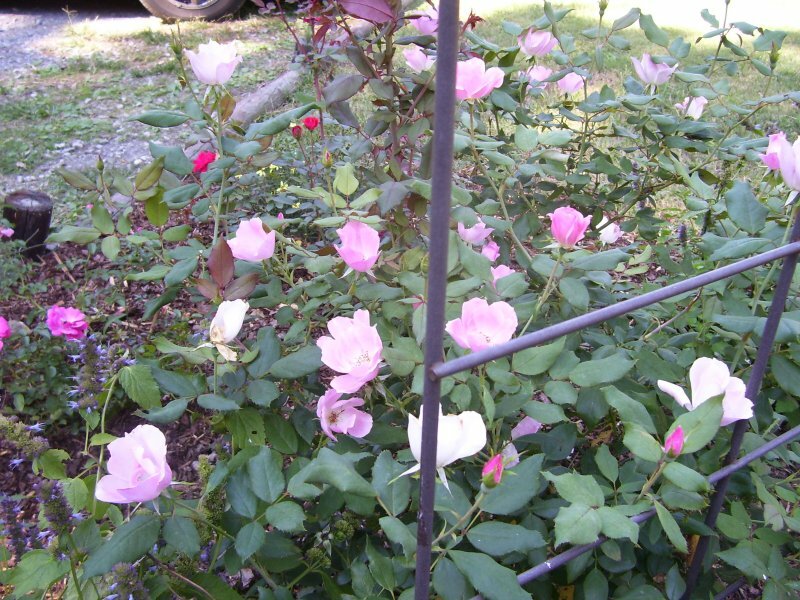 When we got here, there was a front flower bed with a lone trellis standing in it–just begging for some roses! 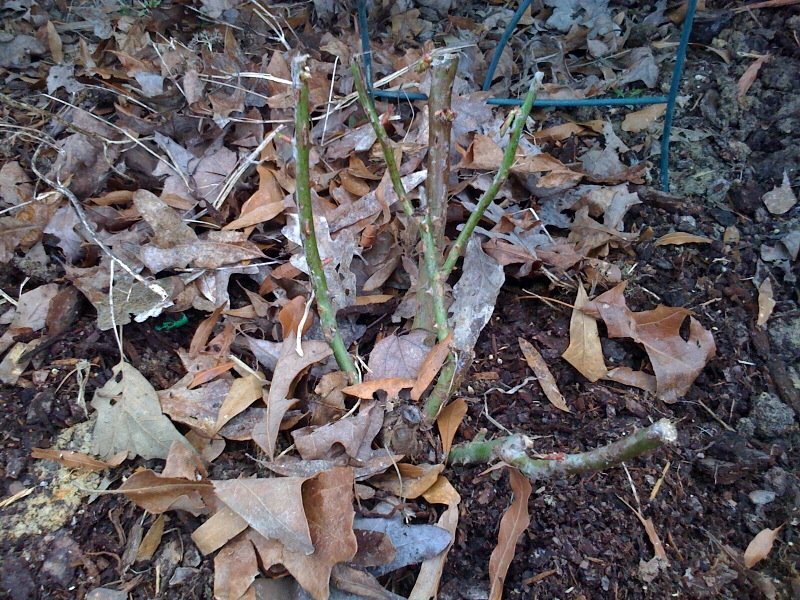 I obliged by purchasing several “knock-out” (ever-blooming) rose bushes at Lowe’s. The great thing was that I hit Lowe’s when all the summer flowers were marked down 50-75%. I got my roses for half off, and I got some coreopsis and a rose “carpet” plant for 75% off. I also picked up another spikey blue flower that the bees and butterflies love, but I can’t remember what it is (should have saved the little plastic marker!). 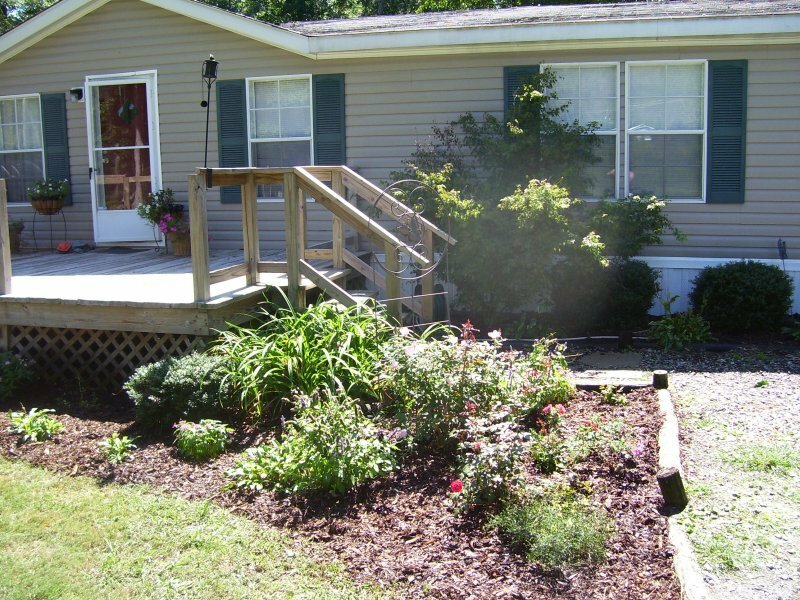 At left you see the triangle-shaped bed to the left of our front walk and at the corner of the deck. Right up against the deck are day lilies planted years ago by our landlord. They are glorious in mid-summer. 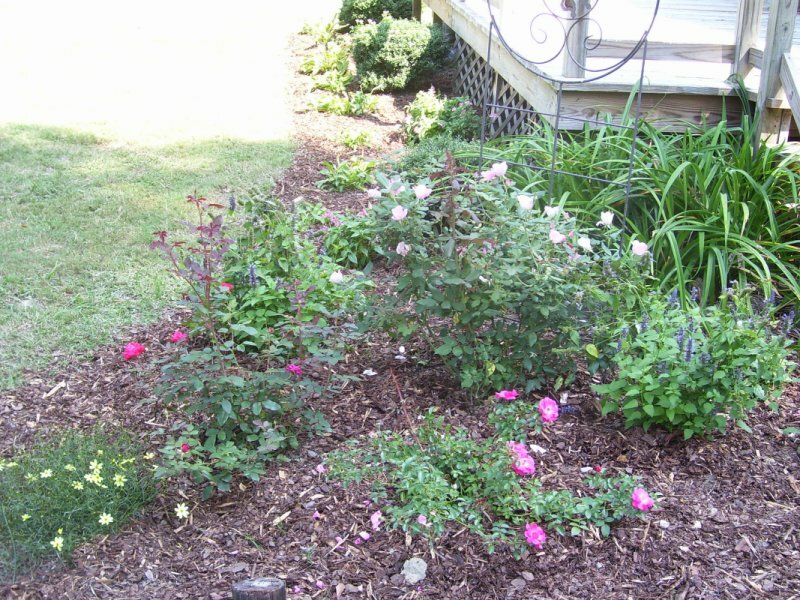 Here’s a close-up of the front bed so you can see the light pink roses in front of the trellis and the deep pink “carpet” rose in the center. 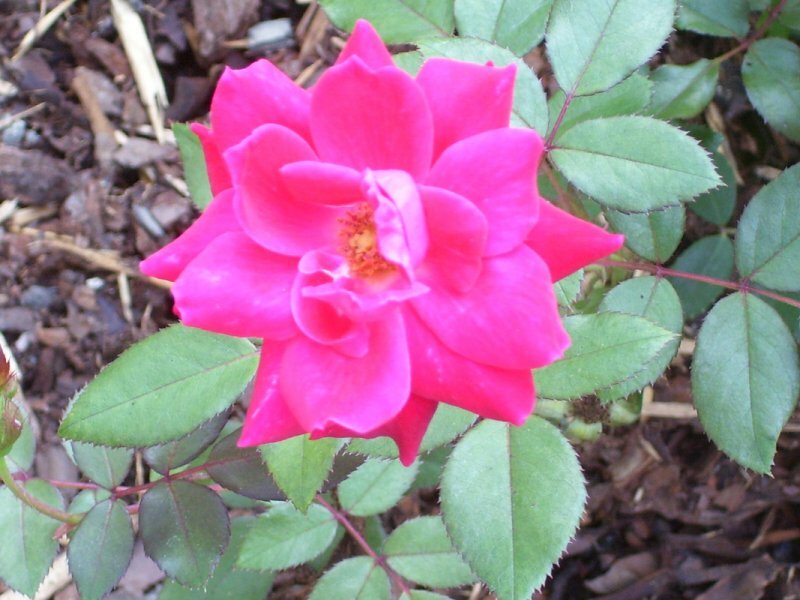 I also have three more small roses (deep fuschia). The strange thing is that the one in the front corner is the same size as when I planted it, but its “sister” on the left-hand side next to the yellow coreopsis has tripled in size! 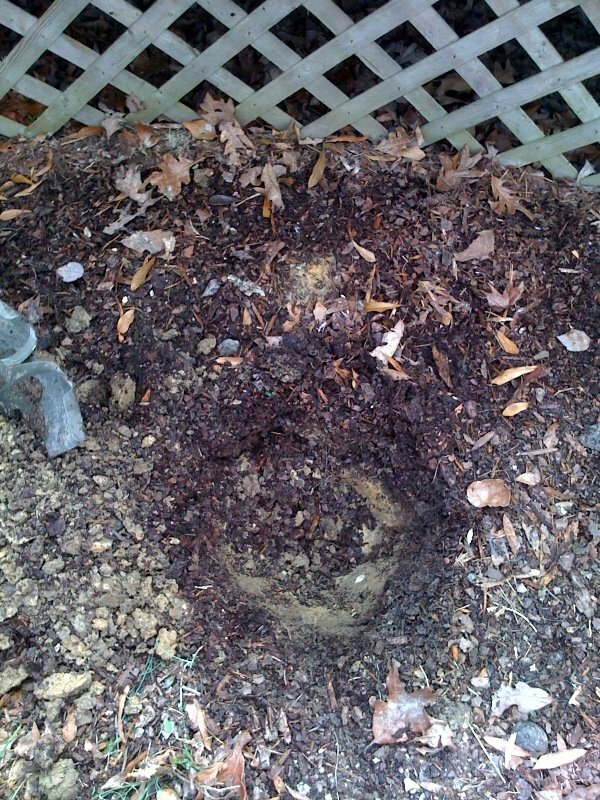 Must be some good soil in that spot! I did use some organic dirt when I put these in, as well as rose food, but I guess there’s still a “sweeter” spot in the garden that the plants just like better! In the background of this shot you can see the little border garden along the front edge of the deck. 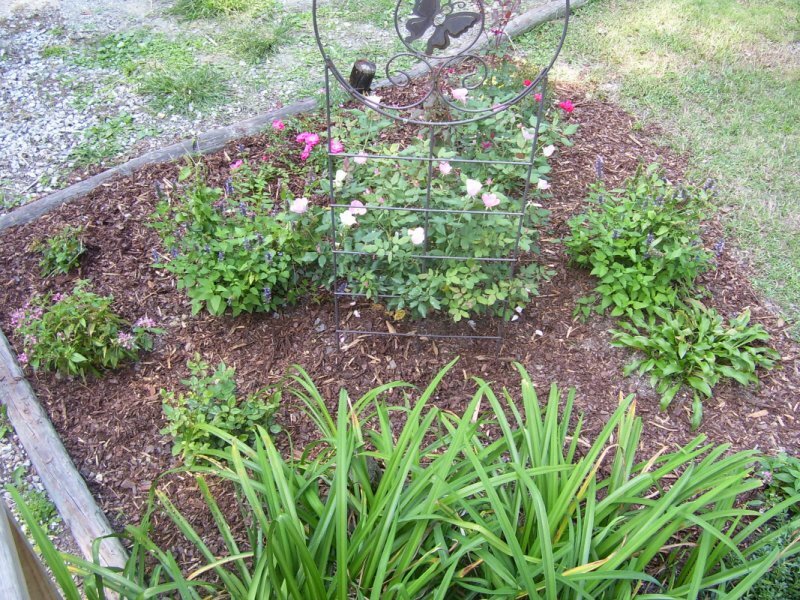 It contains some boxwoods, hosta, and butterfly bushes. The children and I have been tickled pink to see both butterflies and hummingbirds flock to the flowers! And here’s a whole slew of shots to show off these blooming beauties. How I love the colors and scents! Finally, here’s a view of the garden looking down from the deck. It’s a delight from all angles. Next year the plants will have doubled in size and be even more colorful! I look forward to adding more to our landscaping. We have a lovely shaded bed on the western side of the house that will be perfect for a couple of hydrangeas. I’ll be sure to share pictures once we get to work on that part of our landscaping. 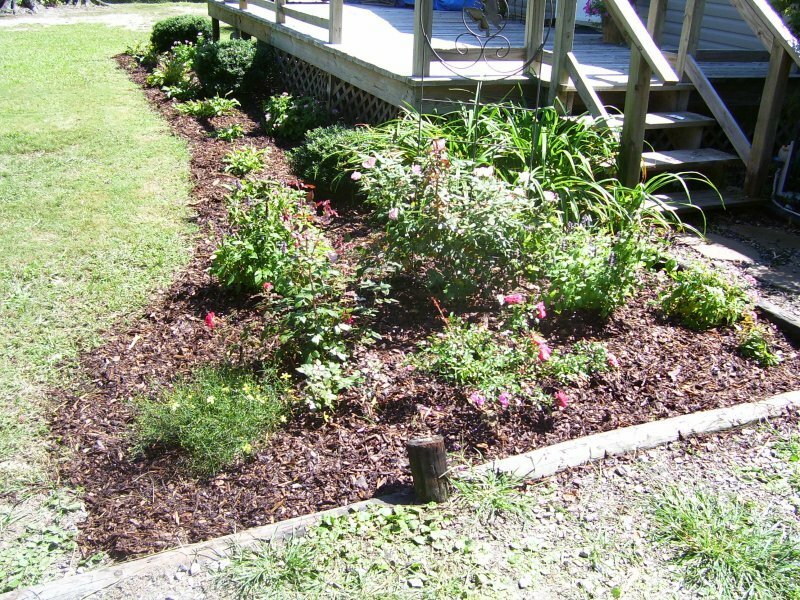 We were delighted to get a free load of mulch to do the front flower beds. The front now looks really trim and tidy. Maybe I’ll start thinking about planting some bulbs now that fall is here…. Hmmm….! Oh, and I do have another short-term project I plan to take care of this weekend. 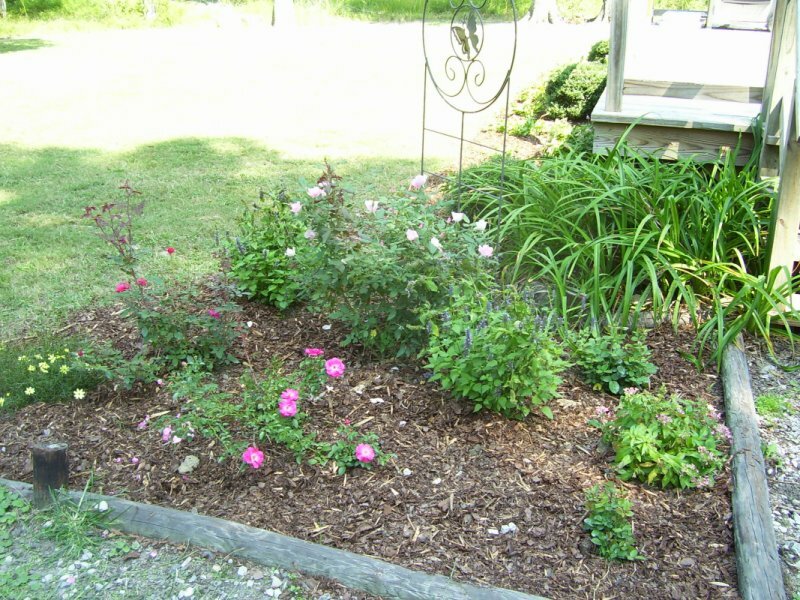 I removed the butterfly bushes I had in my deck planters and put them into the garden near the roses. That leaves some very leggy petunias looking rather spindly. Time to re-do the front planters!